Sherborn, through December 15th, 2018. 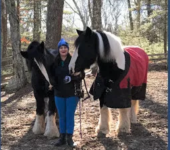 Wildstar Wranglers provides a volunteer opportunity to young adults with special challenges for meaningful work in a supportive environment under the supervision of a professional educator. * Tasks include daily horse care and barn chores. * This experience builds and enhances the individual’s organizational skills, such as following directions, task completion, reliability and attention to detail, all of which directly translate into the person’s role in the community.